The Los Angeles Unified School District lost around $100 million over five days due to the strike led by United Teachers Los Angeles, the district estimates. The district estimates student attendance is dropping substantially. The union and district are back at the negotiating table, but strikes can be expected to continue if an agreement is not reached over the weekend. The United Teachers Los Angeles (UTLA) union and the Los Angles Unified School District (LAUSD) went back to the negotiating table Thursday as teachers were on strike, which the district claims cost an estimated $100 million over five days. LAUSD has more than 600,000 students and district funding is based on student attendance. Close to 157,000 students attended classes Monday, but that number plummeted to around 85,000 by Friday, according to LAUSD numbers available at the time of reporting. There were an estimated 60,000 people — including the union’s members, community members and parents — rallying as of Friday, CBS Los Angeles reported. Metros were flooded with protesters as well. Traffic was also shut down in parts of the southern California city due to the high volume of protesters, according to The Washington Post. About 400 substitute teachers and 2,000 administrators with teaching credentials are replacing the missing teachers, according to the LA Times. Video footage shows multiple instances in which protesters apparently blocked others from entering buildings. Those activists, however, were from the LA chapter of the Democrat Socialists of America. “We say no to scabs because we care more about our children’s futures than a sub making them watch movies all day today,” DSA Los Angeles tweeted Tuesday. 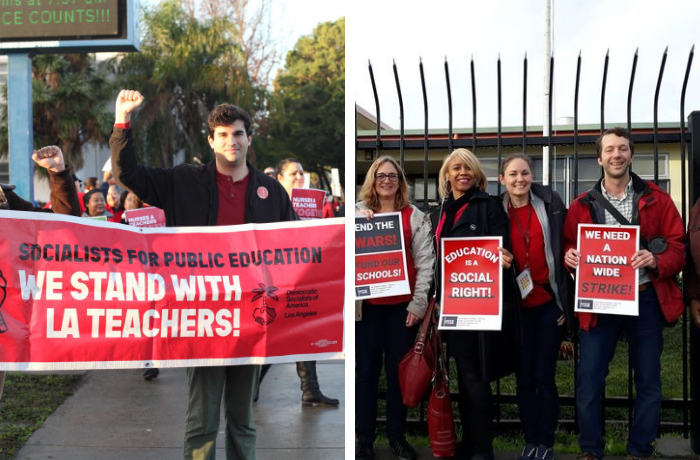 The strike is the result of UTLA and LAUSD being unable to reach an agreement on a plan that lowers class sizes, increases raises by 6 percent and addresses public schools being turned into charters. LAUSD said it did not have control over charter schools as that was handled at the state level. The district added UTLA’s demands would cost nearly $800 million a year as LAUSD is running on a $500 million deficit. “The average cost of health and welfare benefits that teachers receive is $14,562,” a LAUSD spokeswoman previously told The Daily Caller News Foundation. The Los Angeles union said the demands were about serving students. Wall Street Journal editorial board member Allysia Finley suggested in a Jan. 4 op-ed that the negotiations were highly political in nature. Increasing staff, for example, could bring in more potential union members, which would help UTLA regain control of the school board. The LAUSD spokeswoman said a teacher with the right qualifications could earn around $74,000 annually. Former Education Secretary Arne Duncan, who worked in the Obama administration, and California Democratic Gov. Gavin Newsom did not support the strike because they believed it would hurt students. LAUSD says it has more than 80 percent of families living in poverty and 17,000 homeless students. Big-name Democrats in support of the strike include New York Rep. Alexandria Ocasio-Cortez, Massachusetts Sen. Elizabeth Warren and Hawaii Rep. Tulsi Gabbard. Strikes can be expected to continue if a negotiation is not met between the union and district over the weekend.